I've bought an Arduino Zero Pro from https://www.coolcomponents.co.uk/the-arduino-zero-pro-32-bit-with-debug-interface.html. First of all, I've tried the Arduino IDE 1.7 with the programming port, and the Blink uploaded successfully. After that, i wanted to try the debug. So i've connected the programming port and used the Atmel Studio 6.2. It detected the EDBG and wanted to update the firmware. The firmware upgrade was successfully and then i tried to debug a blink on AS: didn't work. My first thought was the EDBG firmware was no OK (very big mistake) so i Google it and found the command to manually update the EDBG firmware. I've asked support to Arduino.org and they point me to the ATSAMD21G18A bootloader and told me to upgrade it. I was unable to do it because the board stop programming. 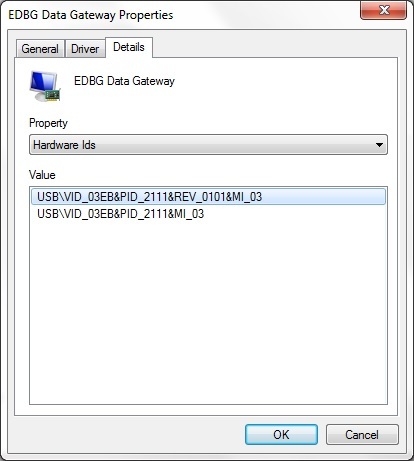 3) Select "Tools -> Device Programming"
4) Select "EDBG" + "ATSAMD21G18A" + "SWD"
6) In the "Memories" field select "Erase Chip" and then click on "Erase now"
Now the board flashes the Leds, the native port gets recognized again but the problem with the EDBG remains: The serial number is not recognized. I found a similar problem with the Atmel Xplained Minis and the have a executable to fix the serial number (http://spaces.atmel.com/gf/project/avr_xp_mini/news/?id=75) but i can't find anything related to EDBG. Anyone knows a way to fix this serial number not recognized issue? There are at least 2 versions of Arduino Zero. I can't find anything on coolcomponents.com, can you give a direct link? And the picture of an actual board you have might help as well. I think this is the only one that you can actually buy now? Anyhow, surely the EDBG is an Atmel chip - is it any different when it's on an Arduino Zero Pro, or an Arduino Zero, or an Xplained Pro, or ... ? Ithink it is. At least on the XPro boards the chip itself does not let you disable JTAG fuses that will brick the board, so it knows something about the target part. Also, when you plug in XPro board, AS will not let you select any chip other than the one installed on the board. But that might be an AS feature and no the EDBG itself. As far as original question goes, I can't really help. I'm actually surprised you can buy one of those boards and that IDE is officially out. I only have Atmel-built Arduino Zero and EDBG there works fine by itself, I have not tries Arduino IDE on it, since I have no interest in Arduino stuff. But that might be an AS feature and no the EDBG itself. I think that's an AS feature ... ? I removed the label saying limited edition and the EDBG is A06-0736. I then opened an "Object File for Debugging" and pointed to the Arduino secret location for the ELF. I had to browse for the INO file. I added a breakpoint at setup() in the INO. Then I could start debugging! I will let you know how I get on. But everything looks as if it should be fairly pleasant. Rubbish. The introduction of EDBG is the best thing that Atmel has ever done. FFFFFFFFFFFFFFF sounds like "nor programmed" or "not present"
mounted. This chip contains information that identifies the extension with its name and some extra data. 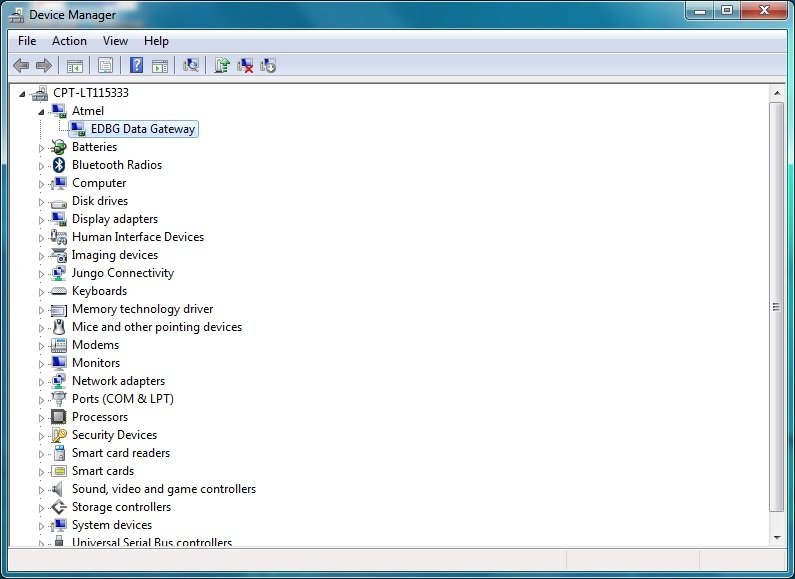 shows the data fields stored in the ID chip with example content. So I guess this ID chip is not present or not programmed on the Zero Pro - so reads as FFFFFFFFFFFFFFF ? But this is just used by AS to identify XPro boards; it shouldn't prevent debugging, etc - as David found. Every other CMSIS-DAP connection that I have ever used has a unique Serial number. If you have multiple CMSIS-DAP devices, you need to be able to distinguish them. However, in practice, most humans debug one CMSIS at a time !!! I have no idea what your ATMEL-ICE has done. As a general rule, you want to let the EDBG firmware handle any upgrade. If you 'do it by hand', you have to ensure that everything is done correctly. e,g, with a regular Mega, you would install a bootloader, set fuses and lockbits. If you miss any step, you have serious problems. Obviously, the EDBG chip was programmed in-circuit at some stage since AFIK it is not a mask-programmed chip. Whether Atmel would release this information is up to them. With luck, you have not erased the EDBG bootloader. Have you tried to upgrade following the steps that I listed? I would be very wary of attaching an ATMEL-ICE to the EDBG chip unless specifically instructed to by meolsen. 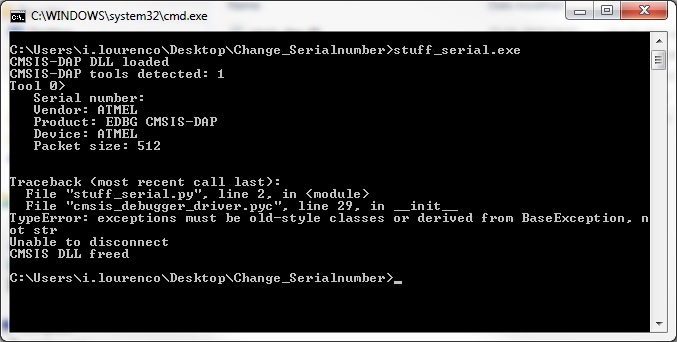 Note that CMSIS-DAP chips from 'other' manufacturers allow you to install firmware without an external debugger. When you flash the EDBG firmware, the COM port changes to another one... that step is not working! Can you do the upgrade with a faster PC ? I had no problem with my Win7-64 Desktop PC. I am glad that I did the upgrade on the Desktop PC. So you have actually re-programmed EDBG chip by hand? Then you have probably erased all identifying information, which is applied at the moment of programming and is not present in the firmware. Where did you get the firmware in an unpacked form anyway? The Zero Pro has got a 5x2 JTAG header for the EDBG chip and a 5x2 SWD header for the SAMD21 chip. You upload sketches via the USB port. i.e. the EDBG chip programs the SAMD21. So it looks as if Moerbius might have connected the ATMEL-ICE to the JTAG header. I presume that the EDBG chip found on the regular Atmel XPRO boards has some method of install / repair of the firmware. The SAMD21-XPRO has some access points for JTAG signals near the EDBG chip. Probably for pogo-pins. is it possible to program the EDBG firmware by hand (cmd). 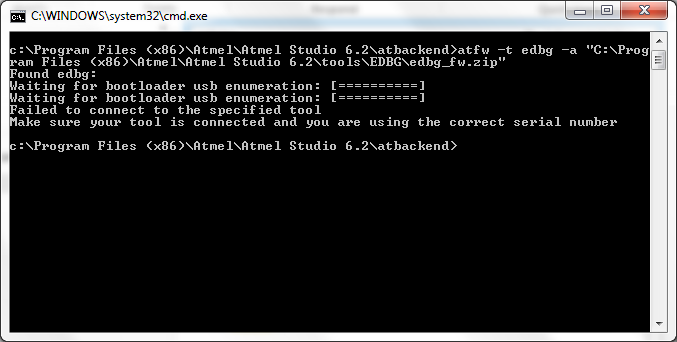 if you look at Atmel Studio folther, you have: C:\Program Files (x86)\Atmel\Atmel Studio 6.2\tools\EDBG wich has the firmware for the EDBG. 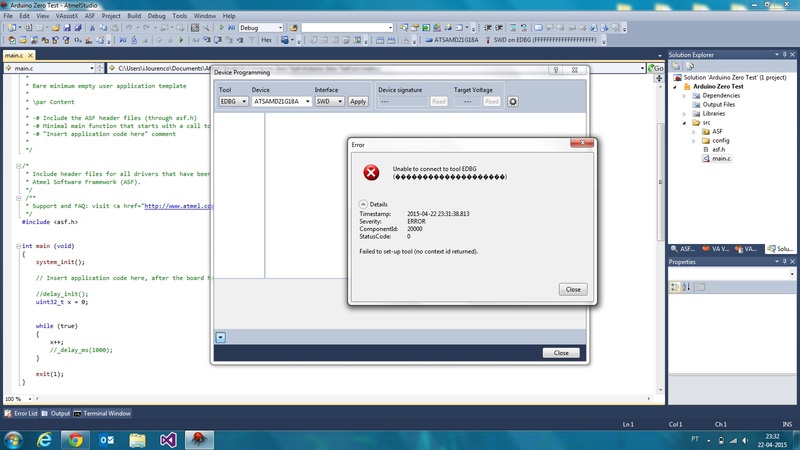 You can use the atfw program wich is located here: C:\Program Files (x86)\Atmel\Atmel Studio 6.2\atbackend to flash it. 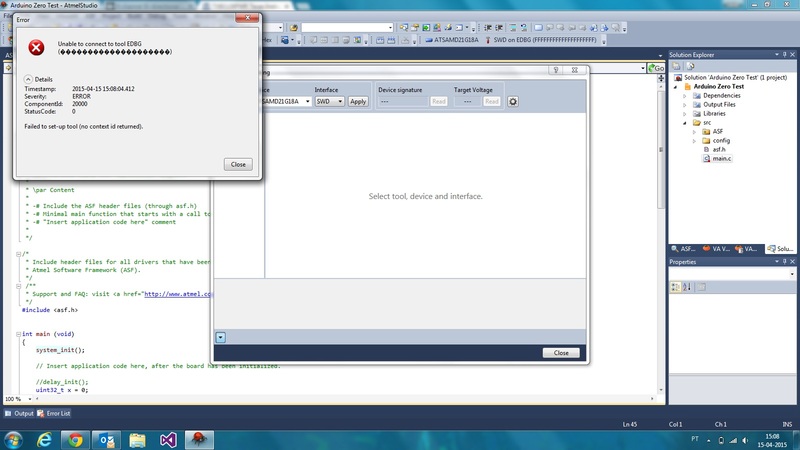 In the state your board is right now, what happens when you go to the device programming dialog in Atmel Studio? Does it recognize the debugger? 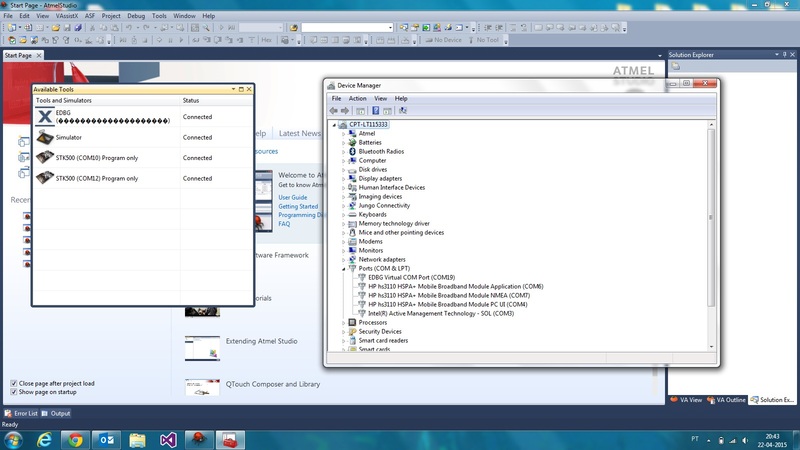 How it looks in the Windows device manager? Not just the COM port, but other devices as well? This is what i get when i connect the Zero on the programming port. 1. 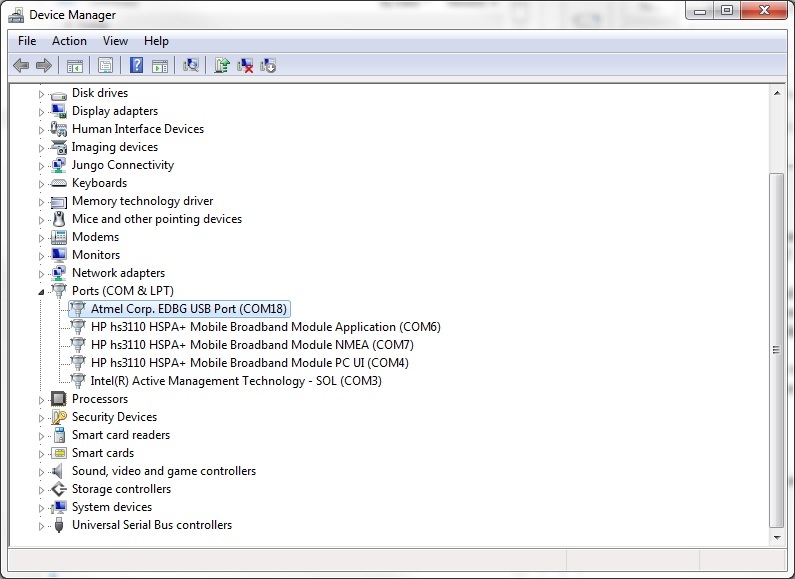 What is under the "Atmel" group in the device manager. 2. 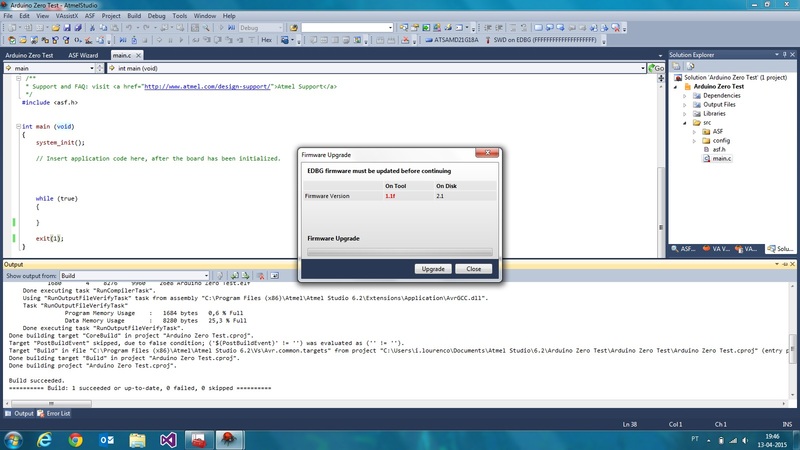 Show how this looks in the "Device Programming" dialog in the AS. Does it let you select a target device and connect to it? So from what I understand, EDBG firmware on the Arduino Zero is different from EDBG firmware (possibly just VID/PID). So you need to ask Arduino guys to give that firmware to you. Atfw can read the firmware back, so you can ask someone with the same board to read it. Right now your board looks like a normal EDBG with screwed up serial number. I don't think you can do that though atfw, so it is likely that the board was like this before. I can't find the actual fix for the ATmega328P-XMINI, but it might work for this board as well. Did you find the files for this fix, or just this blog post? It would be helpful to know what exactly has "failed" during the firmware upgrade. Does it still fail if you try to run atfw agin? I've tried to run it but it gave the error attached. Ok, it looks like this tool is very specific to mEDBG. It looks like an artificial limitation, but it is still there. Also, I'm pretty sure this S/N issue was there from the beginning, so it would be Arduino problem, ask them for support. well the board worked for the first time and had F's on the serial number. Also, regarding support, thats what i did. asked for arduino.org support but they just answer what's on the first post and now i don't receive reply to my emails. I've asked support to Atmel also and the said "go ask arduino"
Ask Cool Components for Help. They are a good company. I suspect that an email from them to Arduino.srl will get a better response. Have you ever tried a 'faster' PC? Perhaps Cool Components might fix it for you. Did it work with Arduino IDE or Atmel Studio? I don't think Arduino cares for a serial number at all. It worked with arduino IDE and Atmel Studio. Now don't work on either.